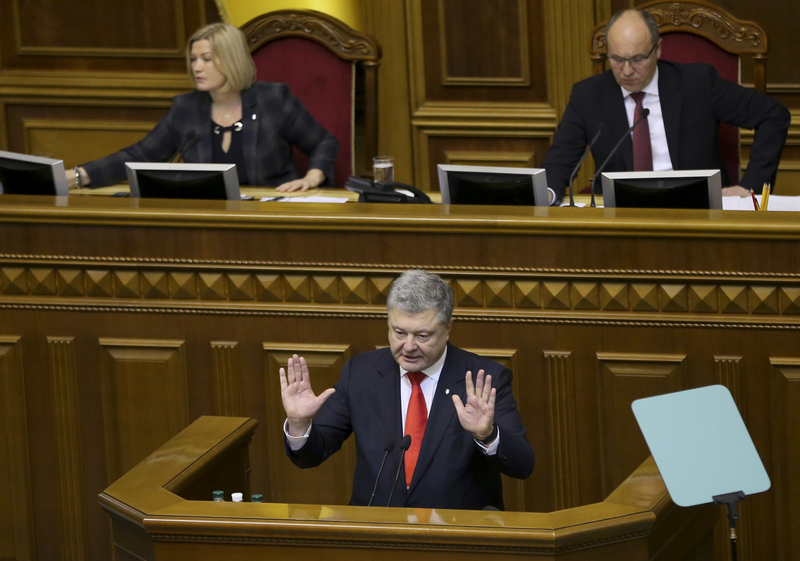 MOSCOW (AP) — The Kremlin warned Tuesday that Ukraine’s declaration of martial law over Russia’s seizure of three Ukrainian ships might trigger a flare-up in hostilities in eastern Ukraine, while Kiev blamed Russia for parading captured Ukrainian seamen on television. On Sunday near Crimea, Russian border guards rammed into and opened fire on three Ukrainian navy vessels traveling from the Black Sea toward a Ukrainian port. The Russians seized the ships and their crews. A court Tuesday in the Crimean capital of Simferopol ordered one of the Ukrainian seamen to be kept behind bars until Jan. 26. The SBU on Tuesday confirmed the presence of its officers on the ships but denied any nefarious intentions, saying they were simply fulfilling counterintelligence operations for the Ukrainian navy. The SBU also demanded that Russia stop using “psychological and physical pressure” on the Ukrainians — an apparent reference to the interviews of the crewmembers that Russia released late Monday. The video broadcast by state television showed three separate interviews with Ukrainian seamen, all of whom agreed with Russian claims that they violated its border. It was not immediately possible to ascertain if the men were talking under duress or had been subject to violence. One of them was clearly reading from a teleprompter. Russia and Ukraine blamed each other for the confrontation that raised the specter of renewing a full-blown conflict in eastern Ukraine. Ukraine said its vessels were heading to the Sea of Azov in line with international maritime rules, while Russia charged that they had failed to obtain permission to pass through the narrow Kerch Strait, which is spanned by a new bridge that Russia completed this year. The bridge is the only land border from the Russian mainland to the annexed peninsula of Crimea. Russia was heavily criticized Monday at the United Nations by the U.S and other western nations for seizing the Ukrainian ships. Asked about previous offers of mediation between Ukraine and Russia, Peskov said Russia has no need for it because it views the standoff in the Black Sea as a simple case of a border violation. The United States and the European Union have slapped sanctions on Russian businesses, tycoons and banks for Russia’s annexation of Crimea. Yuras Karmanau in Minsk, Belarus, Angela Charlton in Paris, Kirsten Grieshaber and Geir Moulson in Berlin contributed to this report.